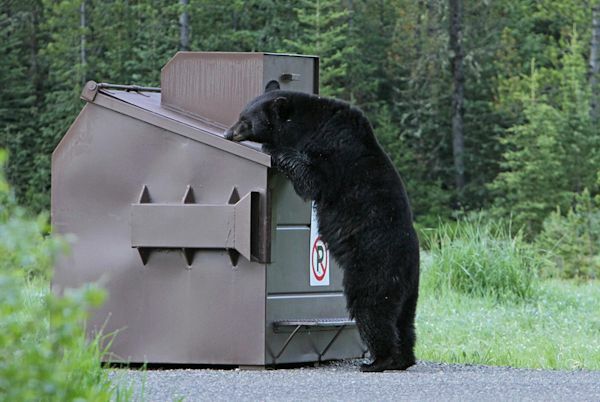 A black bear sniffing a dumpster near Ice Box Canyon, Yellowstone National Park, in Wyoming in 2015. Such access to garbage can lead to conflicts between humans and bears. Bears often get the worst of such encounters; if seen as a threat, they can be euthanized. Photo: Yellowstone National Park/Jim Peaco. Click to enlarge. Bear season is finishing up in some places and still going in others, but environment-related bear stories are perennially interesting. Here are some hints for finding the good ones. But the less obvious ones can help you inform people about larger environmental issues. Some bears get most of the glitz and glam. For instance, the large and legendarily fierce grizzly, or brown bear, is relatively rare and is found mostly in Alaska, the remote Rockies and parts of the Northwest. And then there’s the poster child for climate change — the polar bear — which lives mostly in or near the remote Arctic. But in most parts of the United States, when we talk about bears, we are talking about black bears. Smaller than grizzlies, they are by far the most common species in the lower 48. Here’s a map showing the range of all kinds of bears. In fact, black bears have had robust and often growing populations in much of their U.S. range in recent years. There are about 600,000 of them in North America and 300,000 in the United States (although estimates vary). Status varies, though, by subspecies and subpopulations. For example, the Louisiana black bear (known as the “Teddy bear”) was listed as threatened in 1992, but removed from the threatened list in 2016. Black bears are not found everywhere in the United States. They have tended to favor forested and remote habitats. You may see them in the Appalachians, the Rockies, the Northwest, Wisconsin and Minnesota (as well as a lot of Canada). But these areas are not unpopulated. So human-bear conflict is one of the big stories. and most often tends to be fatal for the bear. One part of the problem: Bears are opportunistic feeders. They are omnivorous, eating plants, fruits, nuts, insects, honey, salmon, small mammals and carrion — but also human garbage. Since bears eat a lot, and are especially hungry when they are putting on fat during the period before hibernation, a human garbage can or dump is a smorgasbord. Or when campers leave their food unprotected, you can’t really blame the bears for trying to help themselves. Food is just one source of human-bear conflict, which typically occurs within the “wildland-urban interface,” and most often tends to be fatal for the bear rather than the humans. Collisions with cars and trucks are a big cause of bear mortality. Many are euthanized by wildlife officers after being perceived as a threat to humans. And there is hunting, which is usually only a conflict from the bear’s perspective. Human destruction of bear habitat has historically been a major cause of declining black bear populations. Clearing of forests for agriculture was the trend during the early parts of U.S. history — but forests have bounced back in more recent decades in some regions for a variety of reasons. As forests recovered, so have some regional black bear populations. In such places, as a consequence, human-bear encounters have increased. Hunting of bears is a big story. Many hunters consider black bears a major trophy (grizzlies, of course, are considered by them an even bigger prize). Take a look at your state’s regulations for black bear hunting. Very likely the season is limited in time, or by number of licenses, or by number of bears allowed to be killed, or by bag limits or special permits. Special seasons for bowhunting and muzzle loaders may even the odds further. Tight hunting restrictions have been credited with helping the recovery of black bear populations. This does not prevent controversy … and news. New Jersey, for example, has one of the largest black bear populations and it is expanding. But controversy there between pro- and anti-hunting groups has persisted for years. Newly installed Gov. Phil Murphy (D) banned bear hunting on state land this year — and the wrangling over that ban in court has gained intensity as the last part of the season approaches. There are something like 16 subspecies of American black bears, and focusing on them may also yield stories. One example: The Louisiana black bear was taken off the threatened list in 2016. But the controversy did not end there, and conservation groups are now suing to put it back on the list. If your audience lives near bears, there is likely to be a story in how to keep them out of the garbage (or even out of the house). For instance, there is a booming market in bear-resistant trash containers. You will also want to check in with your state wildlife agency — the one that issues hunting licenses. * From the weekly news magazine SEJournal Online, Vol. 3, No. 42. Content from each new issue of SEJournal Online is available to the public via the SEJournal Online main page. Subscribe to the e-newsletter here. And see past issues of the SEJournal archived here.